One of today's most interesting conductors, Evgeny Bushkov received early acclaim as a spectacular violinist. He is a winner of four major international violin competitions: Wieniawski (1986), Queen Elizabeth (1989), Tchaikovsky (1990), and the first Henryk Szeryng Foundation Award (1992). An Honored Artist of Russia, Evgeny Bushkov successfully brings his exceptional performing experience and impeccable artistic taste to his conducting. His remarkable abilities, as well as his aspiration to integrity and a search for authentic interpretation, attracted the attention of the renowned conductor Dmitry Kitajenko. The young conductor also received guidance in from V. Yampolsky, in Chicago, USA. Evgeny Bushkov's conducting debut took place in 1999 in France with the orchestra of the International Festival of Luxeuil. He has since worked with several orchestras across the globe including the “Tchaikovsky” Symphony Orchestra (formerly BSO Moscow), Moscow Philharmonic Orchestra, Saint Petersburg Philharmonic, the orchestra of the Bolshoi Theatre, Novosibirsk Symphony Orchestra, Ural Academic Philharmonic orchestra, Neue Philharmonie Westfallen (Germany), Orchestra Sinfonica di Milano “G. Verdi”, Orchestra Sinfonica Siciliana (Palermo), PKF Prague, Belarusian State Symphony Orchestra, State Academic Symphony Orchestra of Kazakhstan, Bilkent Symphony Orchestra (Turkey), Tekfen Philharmonic (Istanbul), Istanbul State Symphony Orchestra, Symphony Orchestra of India, Orchestra Sinfonica de UANL (Monterrey, Mexico), Nizhny Novgorod Symphony (Russia), Belgorod Philharmonic, and Orquesta Sinfonica de Venezuela. Bushkov has also worked with the “Moscow Virtuosi” State Chamber Orchestra, State Academic Chamber Orchestra of Russia, “Musica viva”, and Novosibirsk Philharmonic Chamber Orchestra. Read More... From 2002 to 2009 Evgeny Bushkov was an Associate Conductor of the State Symphony Orchestra “Novaya Rossiya” (Yuri Bashmet, Artistic Director). His highly acclaimed debut with the orchestra in the Great Hall of the Moscow Conservatory in February 2004 was followed by more than 120 performances leading the ensemble in Russia and abroad. Evgeny Bushkov has collaborated with such prominent soloists as Natalia Gutman, Barry Douglas, Stephen Kovacevich, Debora Voigt, Eliso Virsaladze, Maria Guleghina, Vladimir Tchernov, Alexey Liubimov, Dmitry Alexeyev, and Denis Matsuev, to mention just a few. He is regularly invited by Yuri Bashmet to peform works by Bartók, Brahms, and Bruch, as well as contemporary composers Felzer, Kancheli, and Ledenev. Together, they have given the world premieres of viola pieces by Karmanov and Gorelova. In 2003 Maestro Bushkov founded an educational concert series for children that was met with instant success. Since 2009, the series has been performed both in Moscow, Russia, and Minsk, Republic of Belarus. 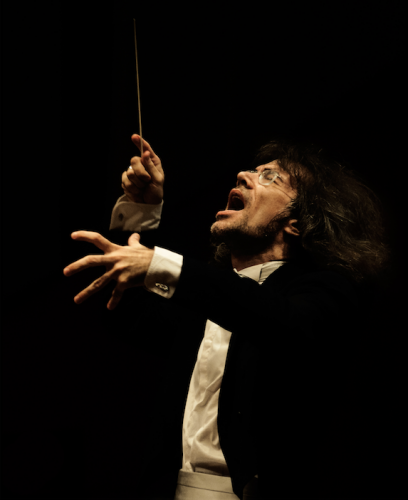 Serving as both conductor and lecturer, Bushkov has championed unique and innovative programming, including works by Debussy, Falik, Bronner, and Podgaits. The series continues to be an unprecedented success, culminating in two Russian premieres of children’s operas by Menotti and Krivitsky, a world premiere of Efrem Podgaits’ Strange String Fairy Tale, and Russian and Belarusian premieres of Paul Patterson's Little Red Riding Hood. The series recently presented its 25th unique program in Moscow. Since 2014, Evgeny has also been leading a completely-sold-out children’s subscription series with the famous “Moscow Virtuosi” orchestra children at the Moscow International House of Music. Past highlights include highly acclaimed performances in the Vienna Musikverein; the Russian premiere of Alemdar Karamanov’s Requiem in Moscow’s Tchaikovsky Concert Hall; the Verdi Requiem in Moscow with the famous italian mezzo-soprano Daniela Barcellon; debuts with Orchestra Sinfonica di Milano “G. Verdi” and the Symphony Orchestra of India; a gala in memoriam of Mstislav Rostropovich; the Russian premiere of John Corigliano’s Symphony No. 1 with the Novosibirsk Symphony Orchestra; a tour in Germany, including a performance in the Berlin Philharmonie, with the Chamber Orchestra of Kazakhstan; performances with Symphony Orchestra Metropolitana in Lisbon, Portugal; and directing the State Symphony Orchestra of Kazakhstan at the International Piano Festival in Almaty. Evgeny also continues his duties as the official conductor of the "Vera Lothar-Schevchenko" Piano Competition in Novosibirsk and Ekaterinburg. For the celebration of the 65th Anniversary of Victory Day, he was invited back to the Orchestra Sinfonica di Milano “G. Verdi”, to perform Schostakovich’s ‘Leningrad’ Symphony. The Orquesta Sinfonica de Venezuela also re-invited Maestro Bushkov to lead their 80th anniversary celebrations. In 2012, he made a highly acclaimed tour to Italy with the Belarusian State Philharmonic Orchestra. From 2012 to 2014 Bushkov served as Music Director of the Saratov Philharmonic Symphony Orchestra, and since 2009 he has been the Artistic Director and Chief conductor of Belarusian State Chamber Orchestra (formerly the Minsk Chamber Orchestra). During six seasons the orchestra under Evgeny Bushkov’s leadership has presented over 40 new programs including numerous world and national premieres and featured world-renowned soloists such as Elisso Virsaladze, Elisabeth Leonskaja, Alla Ablaberdyeva, Denis Kozhukhin, Vadym Kholodenko, Lucas Debargue, Stephen Prutsman, Leonid Gorokhov, Friedrich Lips, and Guy Touvron, amongst others. Notable performances from recent seasons include participation in the 10th Stellenbosch International Chamber Music Festival (South Africa), programme ‘Hommage á Zoria Shikhmurzaeva’ dedicated to 80th anniversary of his mother with the Minsk Philharmonic in the Grand Hall of the Moscow Conservatoire; concerts with the Istanbul State Symphony Orchestra featuring Denis Kozhukhin as soloist; the special Christmas ‘All Winter’ program in Samara with the Volga Philharmonic; performance in Poland with Lódz Philharmonic, featuring Marc Bouchkov as a soloist; the highly successful debut at the 62nd International Ljubljana Festival (with BelSCO) where he was re-invited the following year; and the opening of the Transfiguration Festival in Yaroslavl (Russia), where he premiered Alemdar Karamanov’s Requiem with the Governor’s Academic Philharmonic Orchestra and Yaroslavl Philharmonic Choir. Evgeny also returned to the Moscow Tchaikovsky Orchestra with a program including the Moscow premiere of the Zwei Nachtstuecke by the Austrian composer Erik Freitag as well as works by Dvo?ák and Brahms, remarkable debuts with PKF-Prague, Rostov, and Voronezh Philharmonic Orchestras, and an exciting and challenging all-Podgaits concert to mark the composer’s 65th birthday in the Tchaikovsky Hall with the Moscow Philharmonic Orchestra. In Spring 2016, Evgeny made his debut with Russia’s leading orchestra, the ‘Svetlanov’ Russian State Symphony, performing an all-English program, featuring works by Purcell, Britten, and Elgar. He also made his conducting debut in the USA, on the historic first tour there by the Belarusian State Chamber Orchestra, leading 5 different programs at the StayInMay Festival in Naples, Florida. After a recent collaboration, the legendary pianist Paul Badura-Skoda wrote: "Evgeny Bushkov is one of the best conductors I played with in the last decade". Evgeny Bushkov became Resident Conductor of the Symphony Orchestra of India in January 2017.